Need an amazing dessert to perfectly round off your dinner? This delicious creamy tiramisu cheesecake will knock your socks off! Best of all, this cheesecake is a no bake cake so you can keep your oven off this summer! First off, can we just agree that combining two cakes into one is the most brilliant invention since the sliced bread? Tiramisu means “pick me up”, “cheer me up” or “lift me up”) and it’s a coffee-flavored Italian dessert. It is made of ladyfingers dipped in coffee, layered with a whipped mixture of eggs, sugar, and creamy mascarpone cheese and flavored with cocoa. The recipe has been adapted into many varieties of cakes and other desserts. My original tiramisu cheesecake went viral on Pinterest. It’s a beautiful, extremely decadent cake but it takes quite some time to make. Wouldn’t you want an easier, quicker version of it? Of course, you would. So here it is a no-bake tiramisu cheesecake. If it still looks complicated, trust me it’s not! You’ll love how easy it is to make it and you will make it over and over again, of that I’m sure! Too Delicious to Pass up? What I like the most about this cake is that you can easily mix and match the layers. For example, omit the middle ladyfinger layer and spread tiramisu mixture straight onto the cheesecake layer. Replace the chocolate ganache layer with cocoa powder, chocolate shavings or whipped cream. Make it your own but make it! You will absolutely love it! If serving for your guests, may I suggest an entree? Karageorge schnitzel for meat lovers and for vegetarians my Vatican’s cheese quiche. Both are delicious and impressive. Your company will be talking about your awesome dinner for months! Please note that this post contains links to an affiliate, for your convenience. That means if you click on them and buy anything I will make a small commission. It does not affect the price you pay at all and it supports my cheesecake addiction. 😉 You can read my full disclosure. See post for layer suggestions. Carefully slide a pie server under the crust, making sure it reaches all the way to the tip of the wedge (the first slice is the most difficult and messy to remove). Combine the crushed ladyfingers with melted butter and espresso. You can crush them using a food processor or put them in a Ziploc bag and roll over with a rolling pin until coarsely crushed. Press the mixture into an 8-inch springform. In a small bowl, pour boiling water over gelatin. Stir until gelatin is completely dissolved. Let cool slightly. If it cools too much and it hardens, microwave for 15-20 seconds. Do not boil. This step is optional. I have never had luck getting the filling firm enough without the gelatin. Combine the cream cheese, sugar, and coffee in the bowl of a stand mixer fitted with a paddle attachment (alternatively, use a hand mixer and a large bowl). Mix at low speed to form a thick paste, and then increase to medium speed until soft and smooth. Scrape the bowl and beater with a flexible spatula, then switch to the whisk attachment and pour in the cream. Whip at high speed until stiff peaks form. Gradually beat in gelatin mixture into the cream cheese mixture, if using. Scrape into prepared crust and spread into an even layer. Transfer the cake to the freezer until set, for about an hour. In a medium-size bowl, whip the cream with the mixer on high speed until it thickens and soft peaks begin to form. With the mixer still running, add the sugar and beat until the stiff peaks form. Beat in vanilla. Gently fold in the mascarpone with a rubber spatula. Top the cold cheesecake, still in the pan, with a layer of ladyfingers briefly dipped into coffee. Break a few into pieces to fill in the empty spaces. Spoon the mascarpone mixture on top of the ladyfingers and gently even out with a frosting spatula without disturbing the layer. Return to the freezer for 15-30 minutes or until set. Meanwhile, place the chocolate into a medium bowl. Heat the cream in a small saucepan over medium heat. Bring just to a boil, watching very carefully because if it boils for a few seconds, it will boil out of the pot. When the cream has come to a boil, pour it over the chopped chocolate and let sit until chocolate has softened, about 3-5 minutes. Add butter and whisk until smooth. Allow ganache to cool slightly before pouring over a cake. Remove the cake from the freezer. Release and gently remove the sides of the springform (you can let it stand at room temperature for 10 minutes before removing the sides). 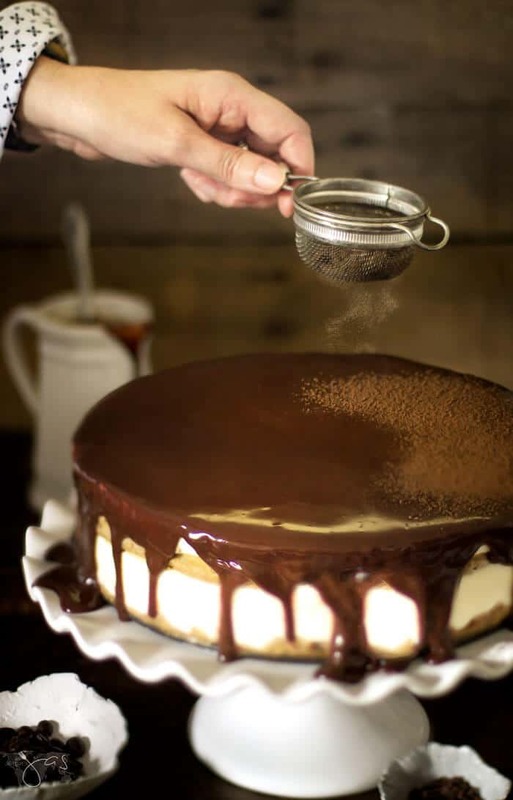 Pour chocolate ganache over the tiramisu cheesecake. Start at the center of the cake and work outward. Decorate the cake as desired. Refrigerate at least for 2 hours, until the ganache layer is cold and cheesecake layer has defrosted. Slice the cake with a sharp straight-edge knife cleaning it with a paper towel between each slice. Store the cake in the refrigerator. Need an amazing dessert to round off your dinner? 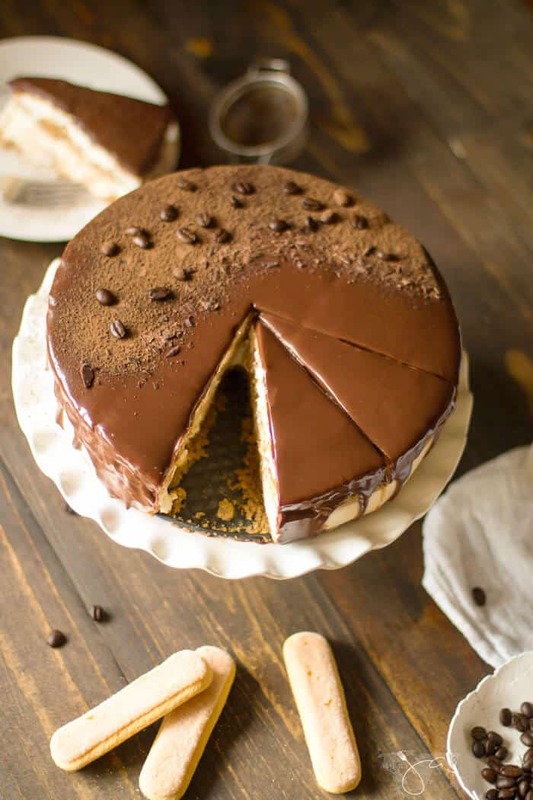 This insanely delicious no bake tiramisu cheesecake will knock your socks off! See post for layer suggestions. Carefully slide a pie server under the crust, making sure it reaches all the way to the tip of the wedge (the first slice is the most difficult and messy to remove). See this recipe featured on The Red Painted Cottage and Miz Helen’s Country Cottage. Mmh, this will make the best dessert for this weekends BBQ party!! Thank you and I love that it’s no bake. Pinned!! I already sent it to my daughter. She has become obsessed with cheesecakes lately. This one will surely be the greatest of them all! It’s open all week & growing…. Hope to see you & this delicious find at the party! We are just swooning for this delicious no bake tiramisu cake! So gorgeous and no heating up the kitchen. Win-Win! Love your gorgeous shots. What a beautiful presentation for your delicious Tiramisu. I am truly looking forward to a slice of this cake. Thanks so much for sharing your post with us at Full Plate Thursday and have a great weekend! This is pure and simple sinful — sinfully tempting and I’m sure sinfully good. I love Tiramisu and I’ve made a Tiramisu cake before but nothing like this. I am pinning and making it!! Oh, it’s one of those sins you love making 😉 Thanks for stopping in, Marisa! Yum, easy and looks delicious! That is the best part, but it is also super delicious 🙂 Thanks, Lisa! Jas, Just letting you know this yummy recipe is one of our features at Share Your Style! Thanks for joining up with us! I have been putting off coming over here because I knew I’d fall instantly in love. I was right! This looks crazy good! LOL! Well, thanks for coming 😀 This cake is truly and dangerously delicious. Wow, is all I can say or maybe heavenly. Ca’t wait to make this. Thanks for sharing at happiness is Homemade. Stop by this week since you will be one of the features. Hi, Beverly! You know how to make day 😀 Thank you! Ya killing me girl!! Oh, my goodness I know when I make this I am going to eat too much. Most of the time when I bake I take one piece/slice and then give the rest away. This one would stay in the house! Thank you for sharing this with us at Celebrate Your Story and have a fun evening. Haha, Sandra, give the rest away before you try your piece. That’s the safest route because it is incredibly delicious. I can’t believe this gorgeous, delicious dessert is easy to make! I’m definitely going to try your recipe. There’s a fabulous dessert cafe in downtown Charleston that makes a delicious tiramisu. Yours looks even better than theirs. I’m featuring this at today’s Snickerdoodle Party. Thanks for sharing your wonderful recipes with us, Jas! OMG! This cake is calling out my name!! Absolutely divine! Thanks for sharing! Gorgeous! I love the way you garnished it! Another no bake, my fav words when preparing in the kitchen 🙂 Thank you Jas for linking up at the #BloggingGrandmothersLinkParty. I shared your post on Facebook, Google+, Pinterest, and Twitter. Thanks for your strong support of #BloggingGrandmothersLinkParty, Jas. 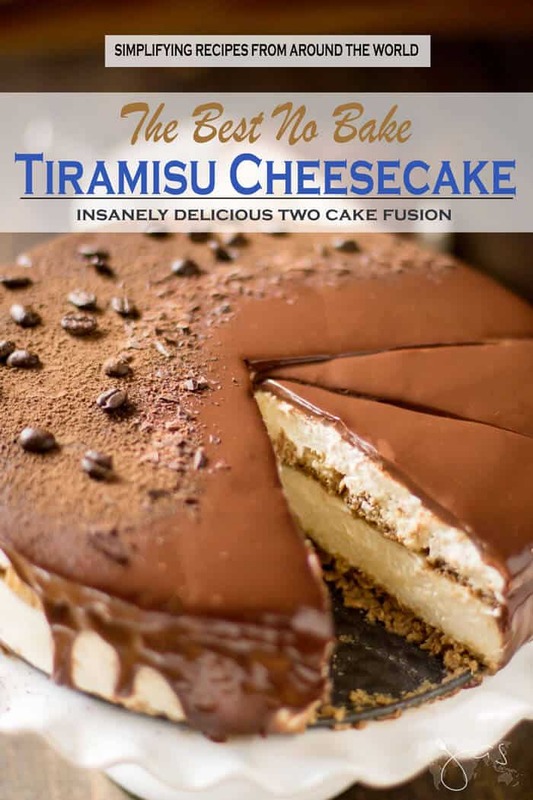 This cheesecake sounds delicious and is on my list! I love the words “no bake” and “simpler version”! Looks delicious! Thank you for linking it up at the #BloggingGrandmothersLinkParty. Me too. Who wants to spend hours baking, ha! Absolutely! Once properly frozen, it can last in your freezer for up to 3 months. When you are ready to eat it, simply put it in the fridge to allow it to thaw overnight. Unless you have a container for it, use two layers of cling wrap, or roll the wrap twice over the cake to make sure that it is airtight. You can wrap either by individual slices if you are not planning to eat everything right away or as a whole if you are sure that you can consume everything once thawed. I really really love your blog. Your posts are amazing. Especially, the tiramisu is omg. I love how simply you make them look. Thank you so much for the good work. I recently got inspired and started my new cooking blog. I would love to be featured on your website. One of the favorite recipes that I have created is http://xhuliocooks.com/recipe/brownie-cheesecake-berries-hazelnuts/ . You had me at cheesecake – I’m obsessed with them! If you’d like to guest post on my site, you can read the guidelines here. However, my editorial calendar is full for the next few months but that will give you some time to create more yummy recipes on your blog. You can email me your ideas and, if approved, I can schedule it for the next open spot. Unless you had something different in mind by being featured? Thank you so much from the kind words! Yess I am from Albania. I will work hard on new recipes for sure. I will write you an email within the day to discuss this further. Thank you so much and keep posting for us. We love it! MUST YOU WHIP THE CREAM SEPARATELY OR WHILE THE CREAM CHEESE MIXTURE IS STILL IN THE BOWL? IF SO, DOES IT GET TO GET TO STIFF PEAK STAGE? SORRY IF I SOUND IGNORANT BUT I’VE NEVER TRIED THAT METHOD BEFORE! Thanks so much for taking the time to reply. i didnt read the recipe properly, but i see now. WOW – its fantastic. My decorating skills are not wonderful, but what a magnificent dessert!